This lovely little bear is called Bourbon. 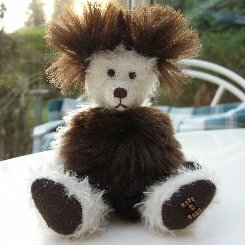 He is made of sparse white German mohair with his tummy and ears in contrasting dark brown dense, soft, luxurious Schulte mohair. The two look great together and the length and thickness of the brown mohair give Bourbon those wonderful ears that so many of you love. He has dark brown ultrasuede pads and paws, a dark brown stitched nose and shiny black German glass eyes. We have filled Bourbon with steel shot, glass bead and steel balls so he has some weight even though he is only 5 1/2" tall. I hope you like him, he costs £40 plus postage. Please note that as with all our bears, Bourbon is not a toy and is not suitable for children. Sorry - Bourbon has been adopted.